Track this CLP Current Event from peaceful protests, to declarations made and renounced, to jail and bail, and more. This is a complicated world event! If you can read just three things, CLP recommends starting with an overview in BBC’s Catalonia Crisis in 300 Words (News Sources), then learning about the colorful, embattled leaders in Rajoy vs Puigdemont: A Profile of Two Leaders from Sky News (Background & More), and finishing with a cliffhanger, Catalonia: Spanish Judge Jails Top Catalan Official Over Rebellion Charges, from Independent (UK) (News Sources). What will happen next? The Catalan region of Spain is in the northeastern corner of the country and is known for both beach resorts and snow-capped mountains. Barcelona, the capital, has an historic Gothic Quarter, La Rambla pedestrian mall, museums and beaches. It is over 12,000 square miles in size and a population of 7.5 million. CLP: start here for an excellent, short explanation. CLP: helpful explanation of the meaning of a possible secession. CLP: call for peaceable protest. CLP: the secession/independence business is complicated! CLP: a helpful look at the latest in what’s happening in Spain and Catalonia. What is the history of the Catalonian independence movement? What is the history of the Spanish Civil War and how might it affect events in 2017? How do countries deal with anti-democratic pasts? How do countries define patriotism and nationalism? What are the economic indicators that make independence an option for Catalonia? 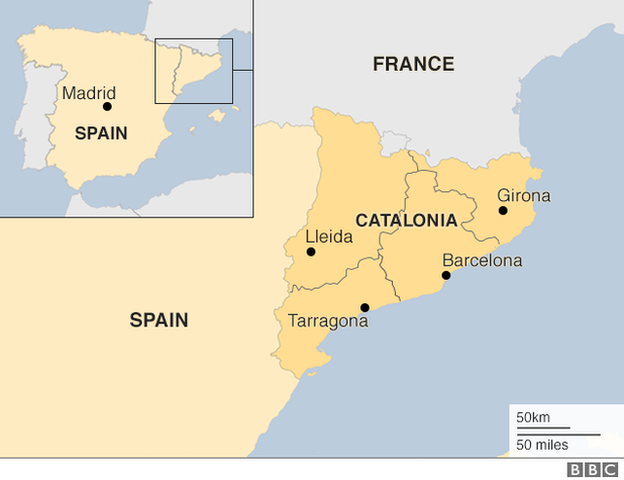 What is the Catalan language? Why is language a powerful cultural indicator? 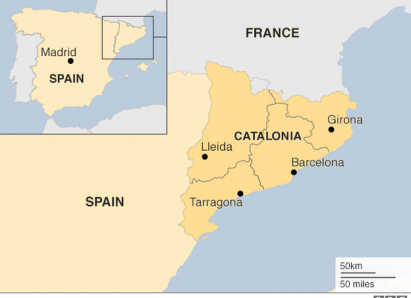 Why is the future of Catalonia significant for the future of Spain? The European Union? Other secessionist movements around the world? Why does Catalonia matter to the world? What other regions of Spain are also asking for more independence? Is secession legal? How are minority and majority rights protected in a secession movement? Is taking over the government and the police force of a region legal? Is it prudent? Is it possible to succeed in an independence movement using democratic means? What is “peaceful defiance”? What are the best arguments for Catalonian independence? What are the best arguments against independence for Catalonia? 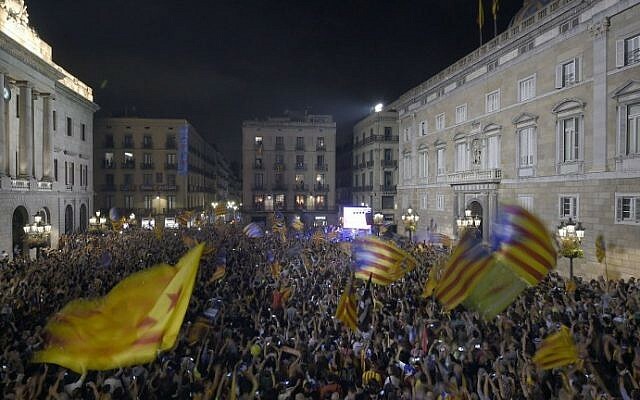 How many Catalonians favor independence? How many Catalonians fear independence? Are negotiations/conversations between Spain’s central government and the government of Catalonia a possibility? Is it possible to mend relations between Spain and Catalonia? What other secession and independence movements exist today? How did the American secession movement (The Civil War) change this country? What do the Catalan separatists do now? Do the secessionists face legal action? Can Madrid really regain control? How great is the economic factor? Will the outside world act over Catalonia? CLP: excellent background for understanding what’s happening in the region; includes timeline. CLP: “hangover” from the Franco days and a real threat to democratic institutions. CLP: learn more about the two men at the center of the battle and their rivalry. Teaching Democracy – How did the Patriots Justify Their Separation from Great Britain? CLP: A neighbor’s look at a national constitution and what it allows. 8.20 Analyze the changing definition of citizenship and the expansion or rights. HS.9 Identify historical and current events, issues, and problems when national interests and global interest have been in conflict, an analyze the values and arguments on both sides of the conflict. HS.11 Gather and analyze historical information, including contradictory data, from a variety of primary and secondary sources, including sources located on the Internet, to support or reject hypotheses. HS.19 Evaluate how different points of view, self-interest, and global distribution of natural resources play a role in conflict over a territory.